Heatec castertips are rigid, wear-resistant products for continuous aluminium thin strip casting equipment, made from shot free refractory fiber. Heatec's unique short removing, vacuum forming, machining and treating facilities, provide uniform density, smooth surfaces, close tolerance and consistency throughout the entire product. Heatec castertips with excellent non-wetting properties, low thermal conductivity, is superior products for continuous aluminium sheet casting. 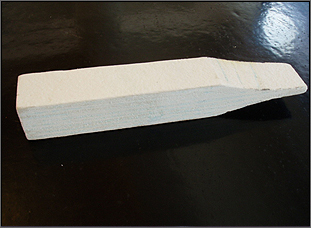 We supply the EDGE DAM TIPS according to ask from customer.